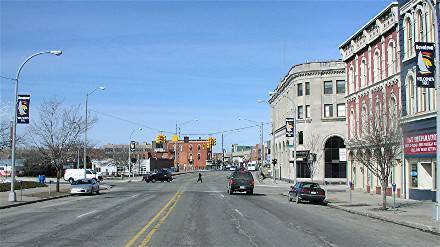 At first US 25 may have come in from the right on Spring, ending at the traffic signal. 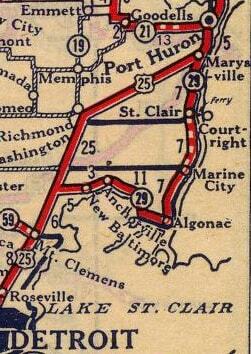 Later US 25 was rerouted to come in on Lake, ending there at Spring. The large image at the top of this page is from an old postcard, facing the same direction. 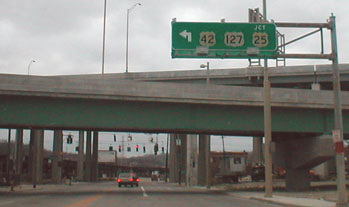 The assembly visible at right indicated that US 25 and M-53 ended there, and M-25 began to the left. 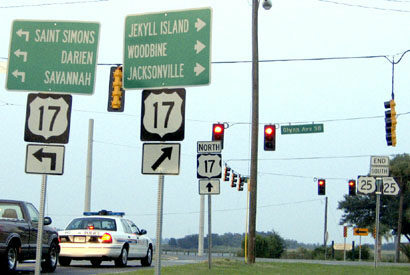 ​Today the highway curves to the right, and at the light in the distance, US 80 splits off by making a left turn. The road goes behind the trees in the center of the photo, and then re-emerges in the upper left corner. 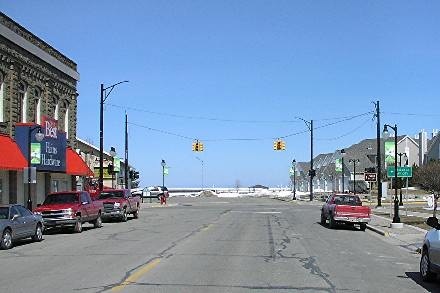 But in the '30s, US 80 followed the alignment visible along the left side of the photo, and right here is where the south beginning of US 25 split off to the right. 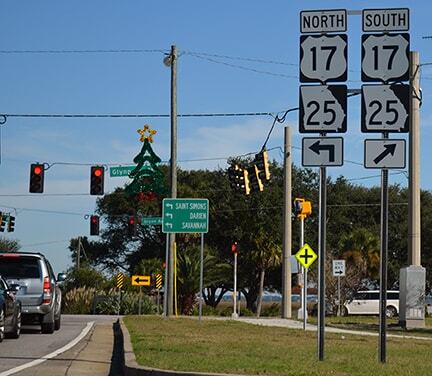 In 1938 the south end of US 25 was extended out of Statesboro along its current corridor, ending in Brunswick GA. 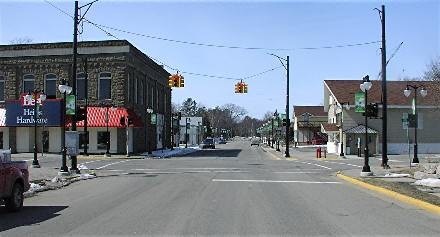 It comes into Brunswick having been co-signed with US 341 for about 40 miles, from Jesup. 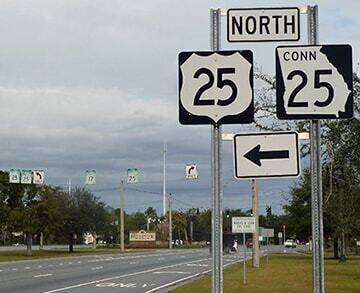 At first, US 25 ended north of downtown (at Dock Junction, the same place where US 341 had ended since 1928), where those routes junctioned US 17 (more info on the Brunswick page). 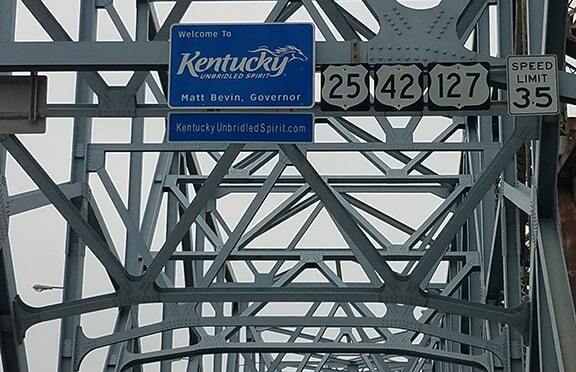 (Note the backside of the sign visible at far left; that is a "Welcome to Kentucky" sign, the frontside of which we will see in a photo below.) 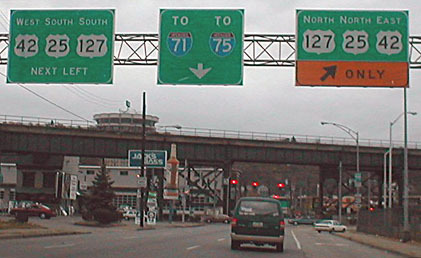 All of those signs were replaced around 2008... except for the US 25 shield. H.B. 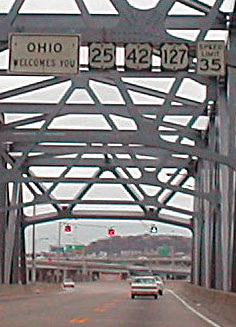 noted that the specs of those signs suggest that they were installed by Ohio DoT, which does not consider US 25 to exist in their state. 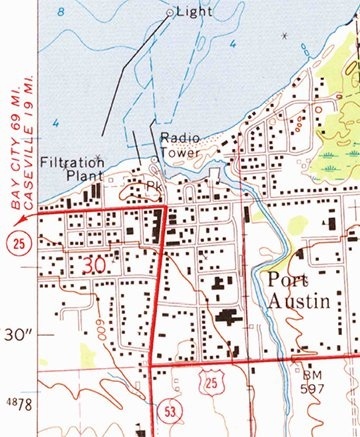 Neither does AASHTO, which lists Covington as the north endpoint of the route. 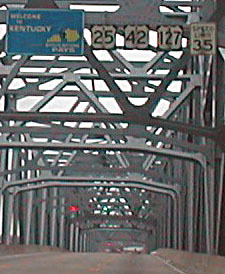 The dispute arises because of a technicality: Kentucky maintains the entire bridge, including about 140 feet that are inside the boundary of Ohio. 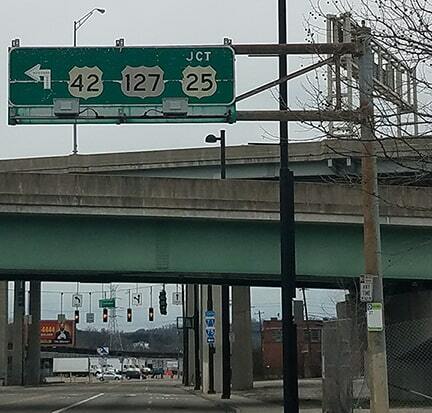 As a result, KYTC's internal description of US 25 has the designation extending to the end of the section they maintain (which is in Cincinnati city limits). However, this is most likely an error, because Kentucky does not have the authority to define a route outside of their borders. 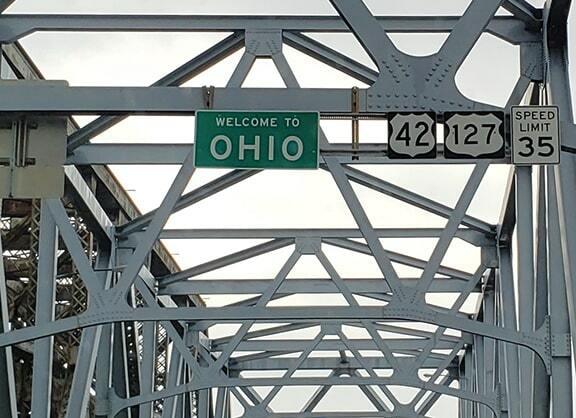 There is no question that they maintain the bridge a short distance into Ohio, but the bridge is designated US 25 only as far as the Ohio line.